I loved RollerCoaster Tycoon 2 on my PC back when I was in high school. I would build each structure wall by wall, landscape, and -of course- building rollercoasters. 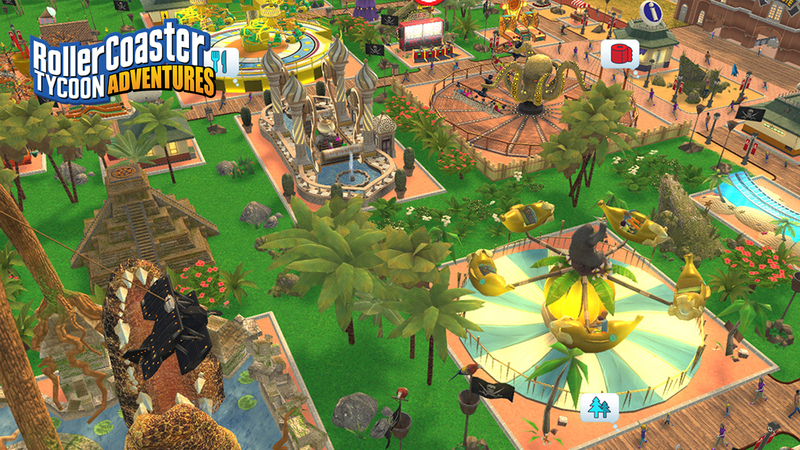 So when I dived into Atari’s finally-released RollerCoaster Tycoon Adventures for the Nintendo Switch at GDC 2019, I was surprised, and somewhat pleased, at the simplistic fun offered in the sandbox mode. You get to design your own parks with plants, rides, and more in RollerCoaster Tycoon Adventures. (Image courtesy of Atari). In RollerCoaster Tycoon Adventures‘s sandbox mode, you are given a rather extremely large -no, even bigger than you’re thinking- grid system to build your own dream park upon. 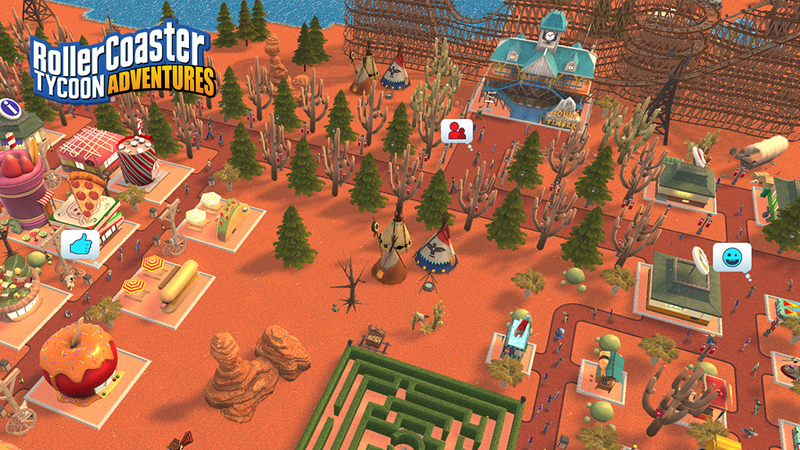 RollerCoaster Tycoon Adventures allows you to pick up and ‘drop’ things like concession stands, landscaping elements, and pre-made roller coasters on the map. You then connect them with a variety of ground tiles in order to have the public be able to access the rides. You can also set prices for admission to the park, from anywhere from nothing to exorbitantly high. 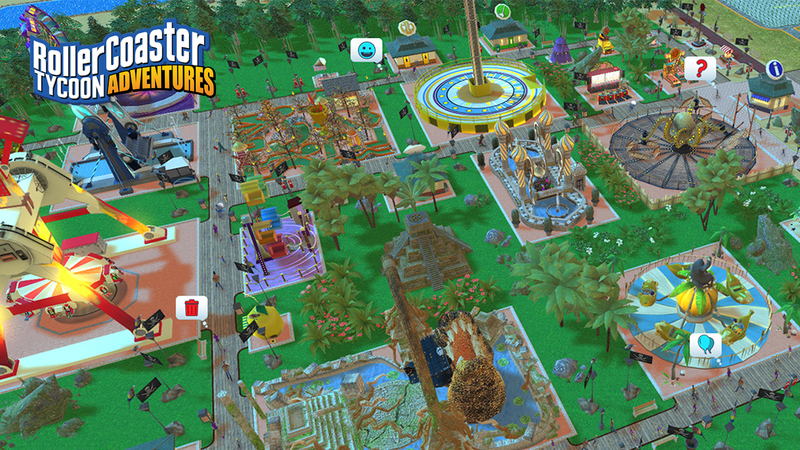 All that said, RollerCoaster Tycoon Adventures will tell you the attending public’s mood as you continue to build your sandbox landscape, and you will have to adjust things around in order to keep people both happy and supplying you with income. Where RollerCoaster Tycoon Adventures truly excels is the controls, as this is a well-handled game on the Nintendo Switch. The controls to select and place shops and whatnot are extremely intuitive and I had no problems doing so whatever. In what turned out to be a pleasant surprise, however, is the controls to adjust a rollercoaster. To adjust one, you first select a ‘node’ on the ‘coaster, and then you adjust it. You then move to another ‘node’ and adjust it to your liking as well. While this does seem initially limiting, I was surprised by the amount of flexibility that I still had to re-design pre-made coasters in my sandbox park. This is a game that is clearly designed to be played with Joy-Con. That said, while I did not get to explore all the ins-and-outs of the game, I definitely noticed that there did not seem to be a way to terraform the terrain like I could in RollerCoaster Tycoon World. While the grid system I was working within was great as a flat plain, I found myself kind of wanting to put a rollercoaster on top of a man-made hill or to throw in a random waterfall wherever I wanted, and this feature was sorely missed by me in sandbox. The lack of control that I had over designing the environment -while still being able to throw down rides and concessions with abandon- really surprised me, and I am hoping that it will eventually be added into the game. The day/night cycle goes rather fast in this game, so you can get fairly quick feedback on your manmade parks. (Images courtesy of Atari). …So please make one, Atari? What kind of rides would you like to make in RollerCoaster Tycoon Adventures? Do you wish that Atari would put out a full-fledged game in the franchise?